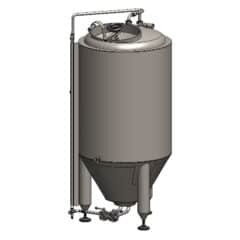 Sterilized compressed air is needed for flushing inner space of the keg, which can contain of the rest of water or sanitizing solutions. 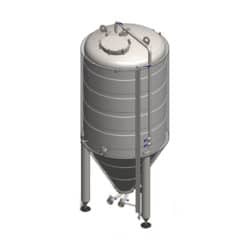 We recommend to use an external hot steam-generator as optional accessories to ensuring perfect sterilization of the inner walls of the kegs and shorter cleaning and sanitation cycle. 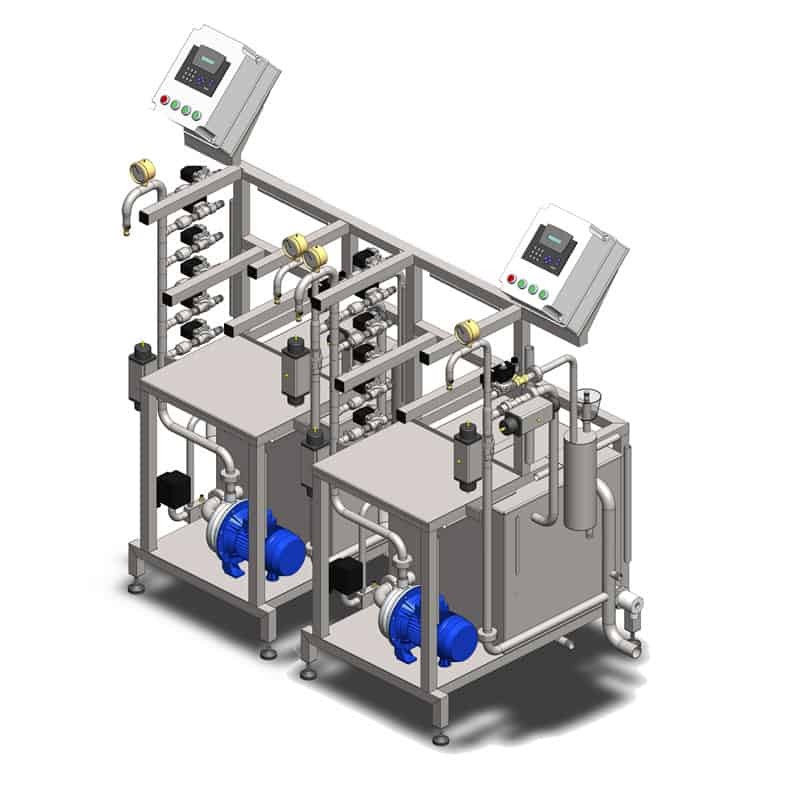 Cycles 1 to 9 are carried out automatically, then an operator has to handle the keg and starts to run the cycle 10. 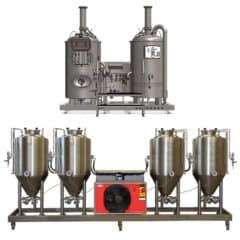 We recomment to use an external hot steam-generator as optional accessories to ensuring perfect sterilization of the inner walls of the barrels and shorter cleaning and sanitation cycle. 1. DO NOT CONNECT THE MACHINE TO THE POWER SUPPLY until you succesfully progress to the step 6. The spiral heater will be burned down (will be destroyed) if the steps are not followed in exact order. We do not hold the warranty in case you burn down the heating spiral. 2. Connect media according to the description on the device. 3. Fill the rear tank with sanitizing solution (6% solution of caustic). 4. 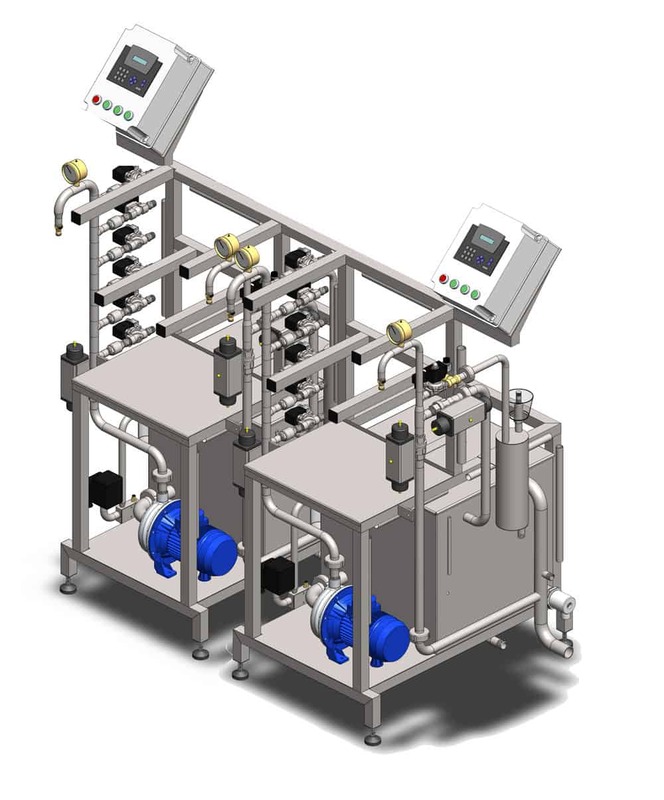 Connect the KCA-40D unit to the air distribution system – minimal pressure 5 bar. 5. 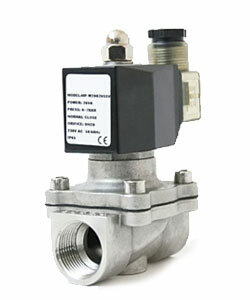 Set the pressure on reducing valve on range between 2 – 2,5 bar. 6. 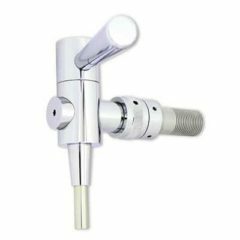 Set the pressure to 2bar using the CO2 reducing valve. 7. Connect KCA-40D unit to the power supply 3ph 400V/50Hz . This description is valid only for the manual mode. The KCA-40D machine provides all steps automatically excluding steps from 16 to 17 – manual filling of the keg. 4. Open valve 1.8 (waste) and valve 1.2 (air). The rest of content in the keg is drained. 5. Valve 1.8 (waste) remains opened, close valve 1.2 (air) and open valve 1.4 (cold water). That is the first rinse of the keg. Time of rinse will vary depending on total volume and degree of pollution of the keg. 6. Close valve 1.4 (cold water), valve 1.8 (waste) remains open. 7. Valve 1.8 (waste) remains open, open valve 1.2 (air). Water is forced out of the keg by air. Time may vary depending on the total volume of keg. 8. Close all valves. Open valve 1.7 (caustic), turn on the pump. The caustic sanitation of keg is in progress. Time may vary depending on the total volume of keg. 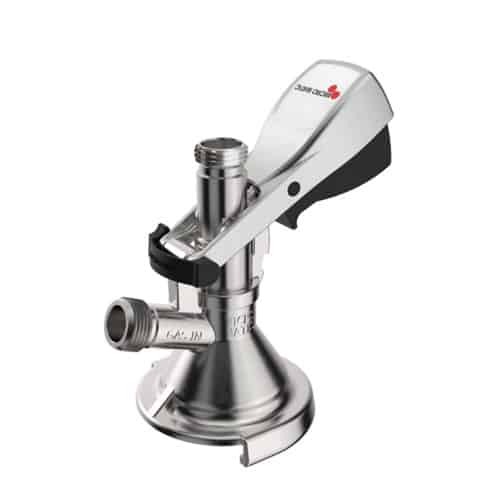 The valve 1.2 (air) may be opened to improve the scattering of sanitation solution. 9. Turn off the pump and open valve 1.2 (air). Cycle of returning the caustic to caustic tank runs. 11. Open valve 1.8 (waste), open valve 1.3 (hot water). 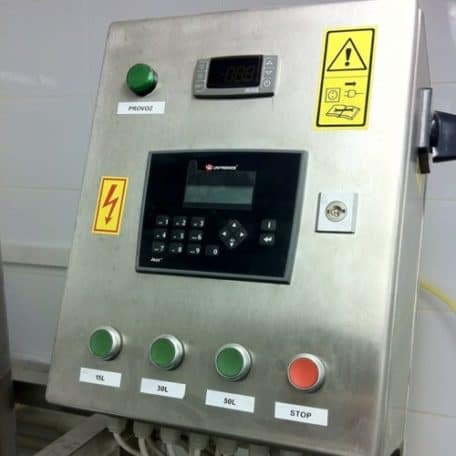 Rinse until the keg is completely deprived of caustic (usage of pH meter is recomended). 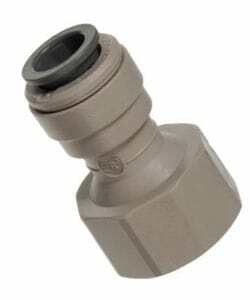 The valve 1.2 (air) may be opened to improve the scattering of hot water. 12. Close valve 1.3 (hot water), valve 1.8 (waste) remains open, open valve 1.2 (air). Hot water is forced out of the keg by air. Time may vary depending on the total volume of keg. 13. Close all valves. Open valve 1.1 (CO2) and open valve 1.8 (waste). Air is forced out of the keg by CO2 gas. 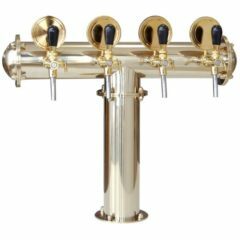 Time may vary depending on the total volume of keg. 14. Close valve 1.8 (waste), valve 1.1 (CO2) remains open. Fill the keg with CO2 until the inner pressure is 1.8 bar. 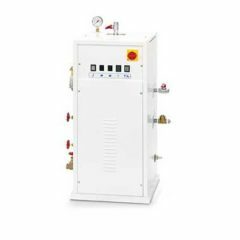 The inner pressure is controlled by pressure regulator. 16. Put the keg on the floor, open valve 1.6 (beer) and open valve 1.9 (outlet of CO2 from keg). 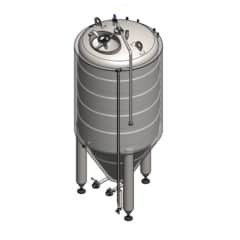 Keg is being filled by beer, filling speed is controlled by pressure regulator. When he beer foam starts flowing from pressure regulator, the keg is full. 17. Keg is sanitized now, filled with beer and ready to be shipped to your customer. 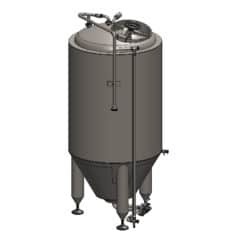 Filling of the 50L beer keg takes from 1 to 4 minutes – the time depends on the chosen overpressure in the keg and in the beer storage tank, temperature of beer, beer type and other physic influences. 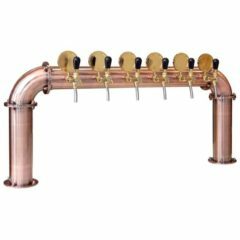 Description of all pipe and hose connections that are available on the KCA-25 machine. 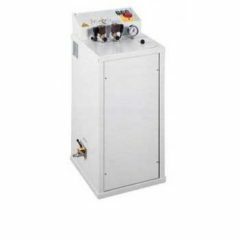 Hot water input G 1/2"
Cold water input G 1/2"
Compressed air input JG 3/8"
CO2 gas input JG 3/8"